Three people have been injured after an explosion occurred on the ground floor of a 4-story apartment building in Istanbul's Büyükçekmece district, reports said Saturday. One of the three injured is currently in severe condition, according to first responders. 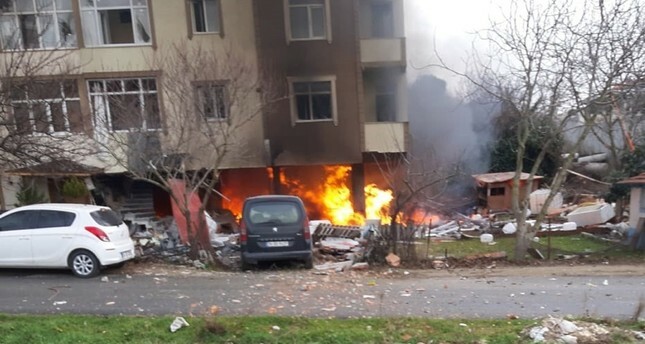 The blast, which took place in the Güzelce neighborhood of Büyükçekmece during morning hours of Saturday, severely damaged the building, sparking a massive fire on the bottom floor. Fire fighting units and ambulances were immediately dispatched to the scene. The cause of the explosion is not yet known but the flat where the explosion occurred is said to have been a bootleg alcohol manufacturing facility.